6 - Day of the Kings (Día de los Reyes) is the traditional gift-giving day in the Mexican celebration of holidays when children receive toys and gifts in honor of the Three King’ visit to baby Jesus. Some restaurants, hotels and The International Friendship Club, one of Puerto Vallarta’s largest charities, annually visits local hospitals and rural communities bringing truckloads of toys to local children. 14 - Friendship Day (Día de Amistad); in Mexico, not just love, but friendship as well is celebrated on February 14. Special menus in fine restaurants, and live music to dance in different latino ambience night clubs. 20-23 - First time in Puerto Vallarta, The National Charro Tournament, at the Lienzo Charro Manuel “Prieto“ Ibarría. Competition the 24 best Mexican teams, including last year champion, and the “Tres Potrillos” ranch team of the famous Mexican singer Vicente Fernandez, one of the best in Mexico. 28 - Becas Ball, is an annual benefit dinner-dance and raffle to raise funds for scholarships for Puerto Vallarta’s students in need. The Scholarship Committee is a long-standing organization of foreign and Mexican residents who work to help meet the financial needs of students unable to continue their education due to economic hardship. The ball is going to be held at the Westin Regina Hotel. 17 - San Patrick's Day. USA Celebration. 13-27 Semana Santa and Pascua, (Easter Break); Puerto Vallarta is at its peak occupancy during this pre-Easter Holy week, a time of national vocational and “spring break” from schools. 26 - Secretary's Day. International Celebration. 30 - Kids' Day. Kids make a parade on streets and have party. Spring is for Seniors: Senior Travelers are offered an extra special welcome to Puerto Vallarta during these spring months. Hotels offer special rates and value packages, the town puts together an extensive calendar of activities, concerts, events and excursions geared just for seniors. In addition, many shops and restaurants in town offer discounts just for those over-60 travelers enjoying Vallarta during springtime. Each year during this month the city organizes the Festival Cultural, where important local, national and international artists (painters, musicians, actors, etc.) organize various events and happenings all over the city. 1 - Labor Day, national holiday. Banks and public government offices remain closed. Fiestas de Mayo (All of May). Traditional fair throughout the month, complete with midway games and attractions, livestock, exhibits, food, drinks and entertainment. It is held in an open field in the charming neighborhood of El Pitillal; across from the cruise ship terminal. 16-30 - Cultural Festival, art exhibitions, music, folkloric ballet, theater, symphonic band, Mariachi band, etc. Hotel Sheraton Resort and Towers. Basketball (16 team men's open): Former / active Olympic / professional / semi-professional and recreational players from Canada, USA and Mexico. Among other competitions are: (1km, 5km & 10km) Terry Fox vs. Cancer Run/Walk, Aerobics Marathon, tennis (all levels), (110) youth soccer teams, Canadian and US Embassy exhibition slow pitch softball, 100+ participants in disc golf. More than 2,000 participants in seven sports. Open to the public to participate or simply enjoy the events. Welcome cocktail approx. (800) persons: Hosted by Municipality of Vallarta, Jalisco Secretary of Tourism and the Canadian Consulate. Social events nightly: Carlos O'Brian's and The Zoo club. Information: Sheraton Buganvilias resort: (322) 226 04 04 ext. 6038 Attn: Verónica Alarcón. 24 - Arrival of Springbreakers for the following 6 weeks. Turtle Preservation Program; Puerto Vallarta has implemented a community-wide preservation program that combines protected nurseries for turtle eggs, plus educational projects. Turtle Liberation ceremonies are held daily during the season at participating hotel beaches. In addition, Vallarta eco-tour operators host nighttime tours to research camps designed to protect the eggs where visitors witness sea turtles laying eggs in their natural habitat and the release of the baby turtles as they make their initial voyage to the sea. Puerto Vallarta’s coastline is among the most important breeding grounds in the world for numerous endangered species of sea turtles. The Puerto Vallarta Sea Turtle Protection Project is a joint effort of the Puerto Vallarta Hotel Association, city government and federal authorities. 1 - Marine Force Day. Mexican Celebration. 2 - National Elections Day. Held in Mexico every six years. 4-12 - Pigeon Racing Tournament Puerto Vallarta’s Triple Crown, six competitions 2 in every distance 200, 300 and 350 Kilometers. For information>>. The State Pigeon Racing Association will have his Annual Assembly from July 10 to 12. 18 - Death of Benito Juarez. Former Mexican president. 24 - End of the national vacations season. 14 - Charro Day. Charros (Mexican horsemen/women) parade through town in morning (beginning at 10:00 am) wearing traditional charro outfits which are beautifully decorated jackets, pants and sombreros. Their finely brushed horses are decked with their best equipment. Festivities continue throughout the day and evening at various charro rings, celebrations include bullfights, calf roping, food and dancing. 15 - Independence Eve; on this night, the central plaza is filled with revelers participating in the traditional “grito”, or cry for independence. Led by the Mayor from the balcony in City Hall, it is preceded by the lighting of the flame of independence and a parade through the center of town. Then, at 11:00 p.m., the cry “Viva Mexico” is made, followed by an impressive fireworks display. Food stands, music and folkloric dance performances are also part of the festivities. Special celebrations and live music to dance in different latino ambience nightclubs. 16 - The festivities continue on Independence Day, a national holiday celebrated by more brilliant fireworks and a parade that winds through the center of town. national holiday, Banks and public government offices remain closed. 24 - United Nations Day. International Day. 31- Halloween; in Mexico you’ll also find costume parties, treats and tricks. Local custom dictates that costumes be on the ghoulish side, and local discos offer cash prizes up into the thousand-dollar range. The real bewitching hour, however, comes a few days later… Special contests and celebration in discos and latino ambience night clubs. Each year during the month of November the city organizes the Art Festival, where important local, national and international artists (painters, musicians, actors, etc.) organize various events and happenings all over the city. 1 - All Soul’s Day (Día de Todos Santos); on this day, Mexicans pay homage to the souls of the children who have passed on. Tradition states that the departed descend from the heavens on this day, so family members prepare for their arrival by leaving sugar skeletons, skulls and treats on altars custom-designed for the occasion. Each year City Hall offers a special alter exhibition, as does the Cultural Center on Rio Cuale Island. Restaurants, nightclubs and stores also create altars. November 1 is also the date of the annual “Informe” or National State of the Union Address by the nation’s president. All banks and government offices are closed. 2 - Day of the Dead (Día de los Muertos); families hold a graveside vigil on this night, or at least leave their favorite food and drink (usually tequila) on a special alter constructed in their home or on the tomb of their departed ancestors. Bakeries are filled with sweets shaped in the symbols of death, and flowers and memorials fill the cemetery. Particularly popular are marigolds, the sacred Aztec flower that represents death. 7-23 - Puerto Vallarta Art Festival: Each November, the exceptional Festival de las Artes takes place, featuring a month-long series of art gallery shows and open-air, beachside theater performances. An impressive range of artwork is displayed from artists throughout Mexico. All events are free to the public, and 2003 will mark the event’s seventh year. 13-23 - Mexico’s premier culinary event is the annual Puerto Vallarta Gourmet Festival, over a period of 10 days. It serves to showcase a spicy blend of culinary talents between the local chefs at participating restaurants and over 20 guest chefs from internationally acclaimed restaurants and hotels throughout the world. The Epicurean fete features gourmet cooking classes, sunset wine tasting and special gourmet menus at all participating venues available to diners only during the festival. It has new surprises that will be announced in February. Founded in 1995, the festival has continued to attract over 20,000 attendees each year, and the organizers expect the numbers to increase significantly in 2003 given the great success of this Festival. 20 - Mexican Revolution Anniversary. Banks and public government offices remain closed. A parade through the center of town marks the anniversary celebration of the Revolution of 1910-1917. 20-22 - The state of Jalisco’s renowned 48th. International Sailfish Tournament (Torneo Internacional Jalisco Pez Vela) one of the most prestigious and taditional national and international tournament on the West Coast. hosts hundreds of coastal and inland fishermen from across the globe to Puerto Vallarta. Anglers compete for the fish in Vallarta’s picturesque Banderas Bay. Prizes are awarded to the boat with the largest sailfish, marlin, wahoo and dorado caught (that comply with local regulations). The event takes place over a weekend in mid-November annually. 27 - Thanksgiving Day. Special dinners are served in the hotels and fine restaurants in town. 29 until Dec 6 - INTERNATIONAL AND NATIONAL PIGEON RACING TOURNAMENT, Celebration of the National Pigeon Racing Federation annual convention. During these twelve days, processions take place to the Guadalupe Processions; during these twelve days, take place to the downtown cathedral that bears the name of the patron saint of both Puerto Vallarta and of Mexico. Guadalupe Day (Día de Nuestra Señora de Guadalupe), is celebrated on December 12, and almost every business, hotel, restaurant, neighborhood and civic association makes a procession to the church for a special mass they have devoted to the Virgin. For the larger groups, these processions resemble a small parade, with folkloric dancers, floats, singing and even fireworks following their brief mass. The Tourist Department downtown displays a poster each year listing the day and time of each organization’s scheduled processions. 12 - Festival of the Virgin of Guadalupe; this important religious and social holiday marks the anniversary of the day the Virgin Guadalupe made her miraculous appearance to a peasant in Mexico. The processions (see above) culminate on this day. On this day, fireworks abound and the central plaza is filled with people street vendors selling fruits and other local specialties. 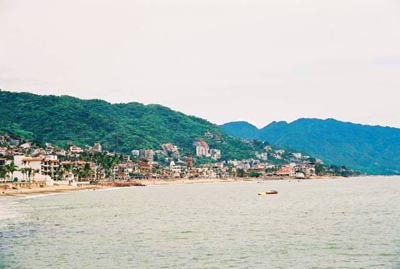 This date also marks Puerto Vallarta’s “birthday.” In 1851, Don Guadalupe Sánchez Torres founded Puerto Vallarta, when he brought his family and a few friends to settle in an area alongside the Cuale River. 12 - Guadalupe Day in Quimixto; the small, south shore community of Quimixto pays homage to the Virgin Guadalupe on this eventful day. Baptisms, first communions and sometimes weddings take place within the local community, culminating with a procession of small “flotilla” decorative fishing boats at 10:00 a.m., which makes its way down the shoreline. The women and children that fill the ‘pangas’ sing hymns in the Virgin Guadalupe’s honor. 12 - Anniversary of the foundation of Puerto Vallarta: Special ceremony at the City Hall Council, and Fiesta at the malecon. The founding of Puerto Vallarta by Don Guadalupe Sanchez Torres in 1851. December 16-24 - Christmas Week. All over Mexico, families, businesses and neighborhoods celebrate the holidays with parties, known as “posadas.” This tradition is a re-enactment of Joseph and Mary’s search for lodging in Bethlehem. Processions are formed to designated houses and carrying candles, the people ask for lodging through a melodic song. The host will refuse several times before finally opening wide the door, signifying the start of the party. The main Christmas celebration is a traditional family dinner on Christmas Eve, followed by Midnight Mass. 25 - Christmas Day (Navidad); religious celebration and national holiday. Banks and public government offices remain closed. 31 - New Year’s Eve generates vibrant fiestas throughout Puerto Vallarta at hotels, nightclubs and homes. In a very special celebration, people get together at the Malecon in Viejo Vallarta, and in Olas Altas Street at Playa de Los Muertos Beach. Special Diners are served in the hotels and fine restaurants. Some of the have live music to dance, if not you will find live music at the latin music night clubs, until 6 A.M.